From moderate day hillwalks to multi-day challenging backpacking hikes and from easy grade hikes to sensational rock-scrambles and climbs, we've hopefully got something to tempt you ! Below are links to information to help you choose a hiking event with us ! Our events range from afternoon strolls on rolling hills in the Southern Uplands to multi-day backpacking in remote wildernesses and to rock-scrambling and climbing on the toughest mountains in Scotland. We grade our events to help you find days that suit your ability and fitness. 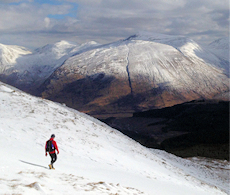 We've put together a checklist of the items recommended for a 5 hour plus route on the Scottish Hills. If you're coming along to one of our events and don't have any of the essential items listed below, please don't fret ! We can help with some of the gear, just give us a call and we'll arrange to bring along spare. 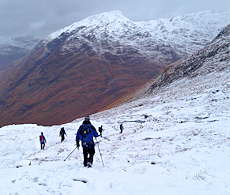 On this page the basic items recommended for a winter walking route on the Scottish Hills are listed and discussed. Links to Pinterest pages for specific suggestions and a checklist are also here. Stuff all of your gear into a 35-40 litre rucksack. Hints, advice and checklists to help you get the most enjoyment out of backpacking into remote areas of Scotland. We can hire out some of the gear, including tents, cooking gear and rucksacks. We've tried to standardise our prices as much as possible and give great value. Prices start from as little as £50 per day on a multi-day hiking event. Some of the feedback on events. There's more on Google Reviews too. If you've got a question, chances are it's been asked already. We've collated most of the frequently asked questions onto this page. Before booking onto an event, please read through our booking terms. If there is anything you need clarified before booking onto an event, please contact us and we will be delighted to discuss.